Everyone is now aware of knowing about the product before purchasing the product. Labeling has become one of the important part as it creates a strong buying incentive. Labeling with an image, the message makes the buyer purchase the product as well as attraction to the product. Labeling machines print and apply labels to various items, products, containers or packages. Different types of labeling machines been used in the industry according to the type of requirement. Companies with a high volume of packaging products integrate the process with the help of labeling machine. Labeling machine helps to design labels with various designs and colours including the product information, barcode, inventory control, and pricing etc. One of the most commonly used labeling machines is the automatic labeling machine that does not require manpower. The process is been done automatically, with the help of the machine. To ensure that the product does not get contaminated by dirt, dust or other, the container is been cleaned with the help of the cleaning equipment. Once it is been cleaned, then comes with the filling process in the container, bottle etc. The filling is been done with the help of filling machine, that depends on the need of requirement. Then the product is been capped and the label is applied in different manners. Different types of labeling available that includes front and back labeling machine of the product, wrap around the product and many more. Not only it provides the information to the product, but also adds creativity to the product. Machine like self – adhesive labeling machine helps to stick labels automatically on products, containers, bottles etc. Other labeling machines like rotary labeling machines, wet glue labeling machine, sticker labeling machines are also used in hair oil label packaging as well as cosmetic and toiletries labels. In the chemical industry, packaging of chemical products comes in a variety of formats that includes paint buckets, oil canisters or cleansing agents. Labeling is done with the help of different labeling machine that includes top labeling machine, double side labeling machine etc. The process of labeling in this industry has to meet extremely large requirements as the chemical industries are subjected to strict legal regulations.For example, false information or content of the container can have an impact on people as well as the environment. Hence, proper labeling with correct information is necessary for this type of industry. In the agricultural industry, pesticides labeling machine is used for pesticide bottle labeling. Along with this industry labeling machines are used in different industries that include pharmaceutical, food and beverage, electronics and many more. Labeling machines can also be used to label wine bottles, plastic bottles, and other unique shapes. 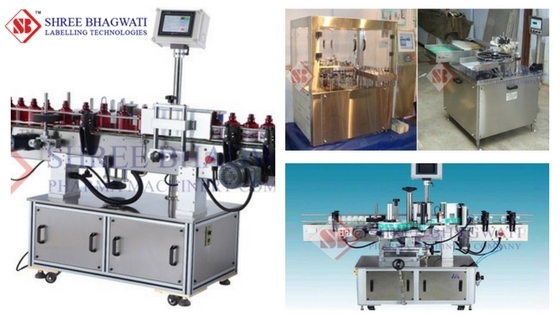 Bhagwati Labeling offers a different type of labeling machines for different industries depending on the need. Our labeling machine includes vial sticker labeling machine, bottle sticker labeling machine – labeling for different shapes bottle, singles and double-sided labeling machine etc. These labeling machines are been designed that helps to achieve good application speed with great accuracy. For more information about the labeling machine contact us today and get acquainted with the different types of the labeling machine.